Safety, power, comfort—these are all qualities you’ll find in abundance across the 2018 Honda Accord trim lineup. However, being a higher trim, the EX is bound to offer a bit more than the LX. If you’re having trouble choosing between the 2018 Honda Accord LX and EX for your Cerritos, Los Angeles, or Long Beach lifestyle, then you’ll definitely want to check out this comparison by the Norm Reeves Honda Superstore Cerritos team. 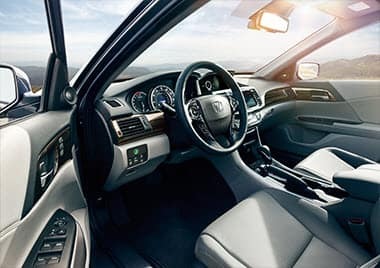 Honda is a brand that always prioritizes safety over all else, a fact that is now more apparent than ever with Honda Sensing® standard on all Accord trim levels, starting with the LX. 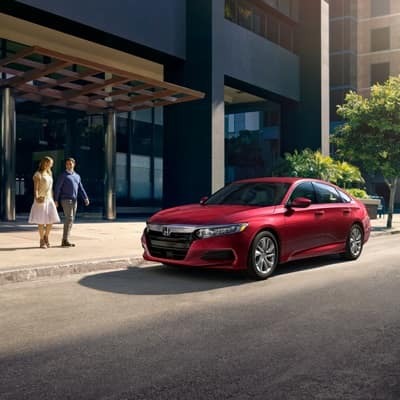 As comprehensive as this suite is, the 2018 Honda Accord EX adds in one advanced feature you won’t find in the LX: The Blind Spot Information System with Rear Cross-Traffic Monitor (BLIS). The major benefit of BLIS is that it keeps you informed of those areas that would otherwise be impossible to see. This will be a huge help out on the road. The Honda Accord has always been a fairly powerful sedan. But now that all its trim levels come standard with a 1.5L turbocharged inline 4-cylinder, it really packs a noticeable wallop. Both the 2018 Honda Accord LX and the EX produce as much as 192 HP and 192 lb-ft of torque. Nevertheless, the Accord EX does offer one helpful feature that you won’t find in the LX. Remote engine start is standard in this trim, so you can start up your car (and your cooling system) ahead of time. Each of these cars tends to offer plenty of amenities. However, as the more advanced trim, the EX goes above and beyond. Just take seating for example. The 2018 Honda Accord LX comes with a standard manual height adjustment. The driver’s seat in the EX, on the other hand, is a 12-way power adjustable seat with 4-way power lumbar support and heating. The EX also upgrades the entertainment system. It adds in great features like an 8-speaker audio system, hands-free texting, Apple CarPlay™, Android Auto™, and more. Whether you choose the 2018 Honda Accord LX or the EX, one thing is for sure: You’re getting plenty of power and safety. You just have to ask yourself if you’d prefer some extra gadgets or not. 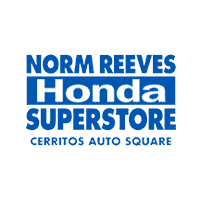 Cerritos, Los Angeles, and Long Beach drivers can test both these trim levels by visiting Norm Reeves Honda Superstore Cerritos. Contact us today to schedule your test drive. 1 30 city/38 highway/33 combined MPG rating for 1.5T LX, EX, EX-L and Touring models with CVT. 26 city/35 highway/30 combined MPG rating for 1.5T Sport models with 6-speed manual transmission. 29 city/35 highway/31 combined MPG rating for 1.5T Sport models with CVT. Based on 2018 EPA mileage ratings. Use for comparison purposes only. Your mileage will vary depending on how you drive and maintain your vehicle, driving conditions, and other factors.